The Form of this Fish is so odd and singular, that without exhibiting its Figure, it would be difficult to give an Idea of it by Words only. This was somewhat less than two Inches thick, the Head and whole Body exclusive of the Fins and Tail, forms an oval Figure, from the hind-part of the Back, and also from the Belly shoot forth two large and very long tapering Fins of equal Size, ending in Points, the half of these Fins next the Body is blue, the rest towards the Points red: The Tail of an Orange Colour, convex at the End. Two small Fins grow behind the Gills, one on each Side, of an Orange Colour, the Basis being black: Under the Abdomen grows another small sharp pointed red Fin, the Forepart of which is edged with blue: On the Fore-part of the Back grows three sharp-pointed Bones, under the Hind-part of the Belly are also three of the like sharp-pointed Bones. The Irides of the Eyes yellow, with two Streaks of blue, one crossing the upper, and the other the under Part of the hides; the Colour of the Head yellow and dusky blue; the upper Gill was armed with many pointed Bones. 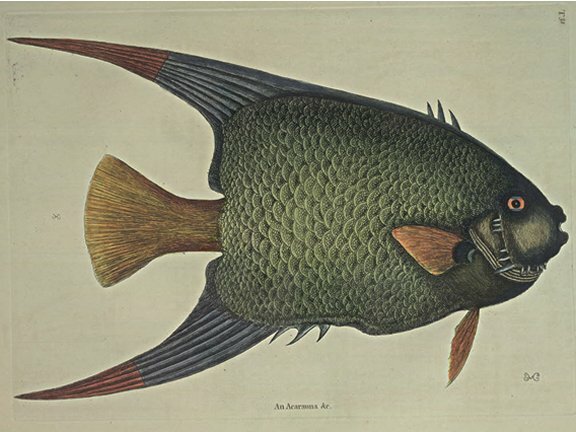 Tho' the Shape of this Fish is singular, the most remarkable Parts of it are the Scales, which are of a dusky green Colour, upon which large Scales are innumerable very small ones. These Fish are taken on the Coasts of Carolina, but on the Coasts of the Bahama Islands are found the same shaped Fish, with both small and large Scales deeply verged with Gold. This Coat of small Scales over the large ones, is a Singularity I believe peculiar to this Fish. They are esteemed in Carolina an excellent eating Fish, and at the Bahama-Islands inferior to none they have.